Thanks to Cali Lewis of Geekbrief.tv for this excellent educational find. Wow! Check out Sodium(Na) and Helium(He) - Very cool! Here is a very Web1.0 version of the Periodic Table. Its from the Los Alamos National Laboratory. Which one would help YOU not only LEARN but actually UNDERSTAND the elements? You can learn more about how to produce educational video like this for training/education at DevLearn08. I saw this a few days ago and was going to blog about it, but you beat me to it! This is exactly the sort of thing we need more of and, to me, is a perfect example of how social media can take learning to another level. I NEVER understood the periodic table in HS, but I think I could actually make some sense of this stuff now. Thanks for sharing, Brent! Wow the Periodic Table of Chemicals is really cool. Such a simple concept in many ways but very functional. That's definitely a great piece. Chemistry is not my strong suit. Usually when I read about the elements or anythign similar, my eyes glass over and I skip as much as I can. Exactly what happened when I looked at the "1.0" example. 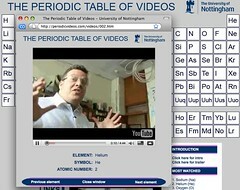 The Table of Videos, on the other hand, made even a chemo-dim-wit like me want to click them all!